The smartphone has become a necessity for many of us as we use them for work, to communicate with our kids, and to keep our lives organized. Unfortunately, with this amazing technology often comes an expensive monthly bill. 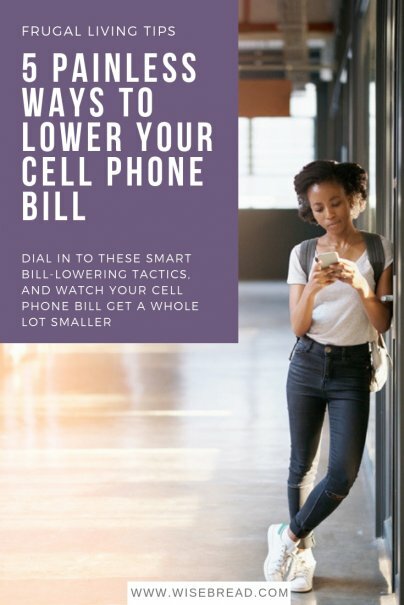 But with just a little bit of effort, you can easily lower your cell phone bill to a more budgetable amount. Here are some important steps to get you moving in the right direction. Are you aware that discount cell carriers like Republic Wireless and Straight Talk Wireless access the same cell towers as Verizon, AT&T, and Sprint? As a matter of fact, the big carriers actually own the cell towers and sell access to the smaller players at a highly discounted rate and pass the savings along to you. For example, Republic Wireless uses T-Mobile towers, and Straight Talk taps into Verizon, Sprint, and T-Mobile. Use this information to your advantage when deciding if one of the discount cell carriers is for you. Before you decide, be sure to analyze the cell coverage in your region before switching. For example, if your area has poor coverage with T-Mobile, but good with Verizon and Sprint, then Straight Talk might be a better option than Republic. You can save a lot of money every month if you do switch. For example, Straight Talk offers unlimited talk, text, and 5GB of data at 4G speed for only $45 per month. The same plan with Verizon will cost you over $70. If you're happy with the carrier you currently have, but don't like how much you pay every month, consider calling them up to negotiate a better rate. This is especially true if you're month-to-month with your carrier and aren't under a contract. Start by doing a few minutes of homework and check out what the competition is offering. Take note of plans similar to yours that are cheaper. Those less expensive plans are going to be your negotiating ammunition. When you call customer service, tell the first person you speak with that you want to cancel your service as it's too expensive. Without fail, they'll transfer you to the customer loyalty or retention department. These are the folks who have the authority to lower your bill. Keep in mind that cell companies spend a lot of money on new customer acquisition and are often willing to throw you a bone to keep you on as a loyal customer. Immediately tell them about your research and the cell carrier you're considering switching too. At this point, the retention specialist will either offer you a discount to stay on as a customer, or tell you they can't meet the competitor's lower rate. In my experience, it's typically the former. At the very least, most company reps can help you dissect your bill in order to cut out any add-on services you might pay for, but rarely use. Many employers work with cell phone companies to provide their employee with a discounted rate. Some of the more popular jobs that often qualify include teachers, state and local government jobs, military, and many corporate jobs. Each provider offers a little different discount so your best bet is to check the big four linked below to see if you're eligible for a discount. Most discounts are in the 10%–25% range. For example, my wife is a public school teacher and she gets a 15% monthly discount from Verizon. All she had to do to get her discount was walk into a Verizon Store and show them proof of her employment. It's easy to fall into the trap of being happy with your cell phone service and ignore the small details. Like if you actually need everything on your plan that you pay for month-after-month. Pull out your bill and examine it with a fine tooth comb. Are you being charged for things like enhanced voicemail, a 411 service, phone insurance, or roadside assistance? If you don't need it, or rarely use it, cut it out of your plan and save some easy money on your monthly bill. Also, be sure to look for family share plans that many cell phone providers offer these days. While not heavily advertised, they provide an excellent way to save if you need multiple lines. The more lines you add, the less you pay for each additional line. I recently had a former authorized Verizon seller inform me that unlike "Verizon Store" employees, they were not paid a commission when they increase a customer's data plan. She worked at a Verizon kiosk at Costco and she said it's the best place to go to get help understanding your bill and possibly get it lowered. They'll go through it with you, look for spots to save, and let you know about any special discounts they might have available. Actual Verizon Store employees? Not so much. While this is not necessarily a tip that will get your bill lowered, it's good information for Verizon loyalists. Always visit the authorized seller locations as they have employees who don't get paid for raising your bill.